In celebration of everything April and foolish, For Honor is having a limited one-day long event where the Rabbids enter the medieval world of knights, vikings, samurai, and exiles. This event is currently live and will end at 9PM PDT. Are you ready for bwaaaaaaar? 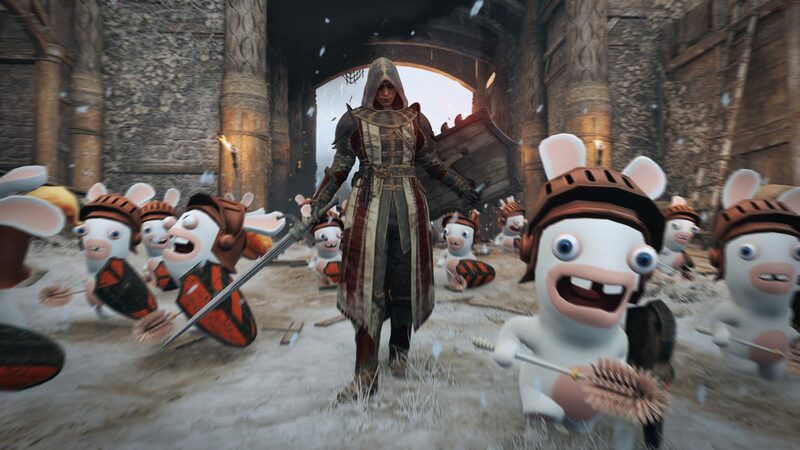 The Rabbids are taking over for the minions in a special, 24-hour For Honor April Fools’ Day event. Starting March 31 at 9PM PDT, and ending April 1 at 9PM PDT, players who jump into For Honor during the event will earn a melee pack as a reward. This event comes as a part of For Honor’s Year 3 content, called Year of the Harbinger, which also recently saw the addition of The Black Prior to its roster of more than 20 Knights, Samurai, Vikings, and Wu-Lin. New content will continue to roll out throughout 2019, including additional seasonal events. For Hono’s Year 3, Year of the Harbinger is already underway with Vortiger, the dark hero, already available. The Rabbids invasion event will last today only and end at 9PM PDT. For more information, visit the official website.